Guinea pigs have longer life spans than many other pet rodents. While your guinea pig could easily be around for five years or more, mice and hamsters live just a couple of years. The longer life span means more responsibility and a longer commitment, especially if you want your guinea pig to live a healthy happy life. Guinea pigs live an average of five to seven years, according to the University of Pennsylvania's Penn Veterinary Medicine. Average means some guinea pigs live longer lives and some live shorter lives. For example, the University of Michigan's Museum of Zoology points out that guinea pigs can live up to 14 years. Which type of guinea pig you have at home determines how long he can live. Hairless guinea pigs, for example, have a higher life span average -- seven to eight years -- than other types. Long-haired guinea pigs, on the other hand, live less, with average life spans of five to six years. 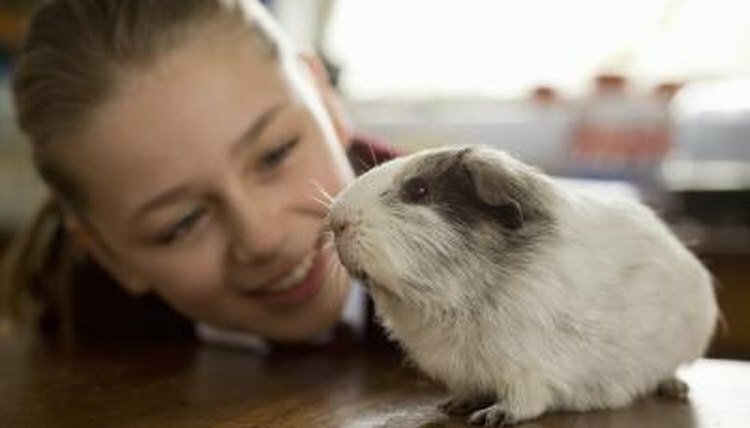 How well you care for your guinea pig will affect how long she lives. A healthy, well-balanced diet will do wonders to extend your guinea pig's life. For example, the University of Pennsylvania's Penn Veterinary Medicine recommends not feeding alfalfa hay to your guinea pig because its high calcium content can cause health issues. Instead, buy Timothy hay or orchard grass. Also, guinea pigs cannot produce vitamin C and must be fed supplements or fruits high in vitamin C in order to stay healthy. Guinea pigs can suffer from a number of health conditions. Treated early, many of these conditions can be easily overcome. However, if you ignore the early signs, you might end up with a medical emergency and unknowingly shorten your guinea pig life span. Common health issues include tongue entrapment -- caused when teeth grow too large -- and bumblefoot, which is characterized by ulceration of the feet. Small Animal Channel: What Happens As Guinea Pigs Age? How Long Do Pet Mice Live? How Long Does the Average Housefly Live?